Mar. 5, 2019 3:10 p.m. When a government or developer announces plans for an infrastructure project, a point of contention for neighbours, quite often, relates to heights, floor area or aesthetics. 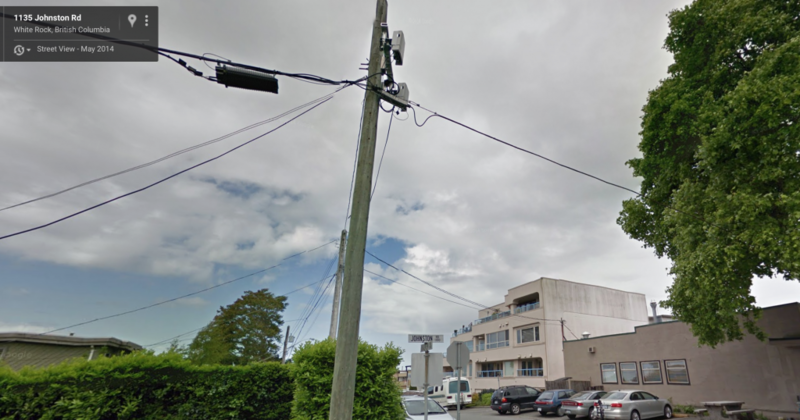 But two South Surrey residents opposed to a planned cell tower in Crescent Beach don’t have a problem with how the structure will look, they’re taking issue with what the tower will emit. Pixie Hobby and Carl Katz say the electromagnetic energy they anticipate to be emitted from the cell tower, proposed near 12189 Beecher St., not only harms wildlife, but can have an impact on human health. Katz, who says he has a “moderate” sensitivity to electromagnetic fields, said the proposed tower should be relocated away from businesses, homes, and the beach. 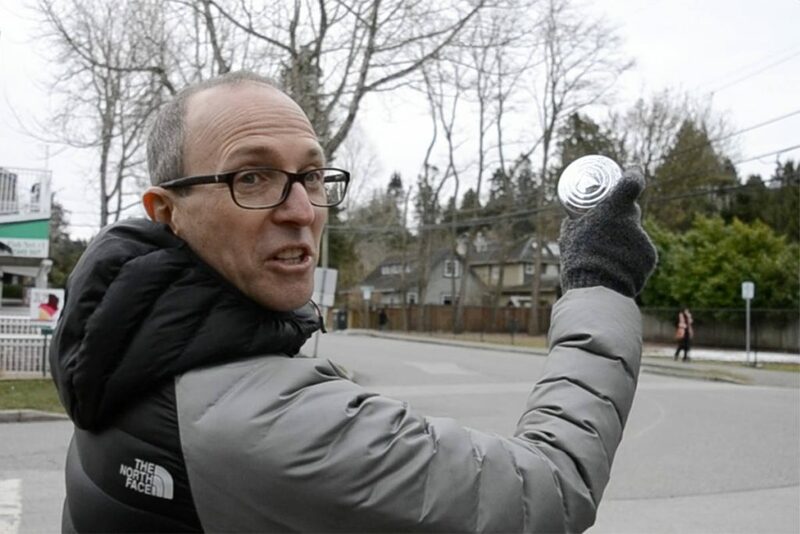 Standing at the location of the proposed cell tower, Katz read a list of symptoms to Peace Arch News Wednesday that people could experience if they have a hypersensitivity to electromagnetic fields. These symptoms included a ringing in the ears, sleep disturbances, blurred vision, dizziness, memory loss, brain fog, chemical sensitive, depression, anxiety and heart arrhythmia. “There are people out there that are debilitated,” he said. Katz, who works in information technology, said he’s taken steps in his lifestyle to build resilience against electromagnetic fields. Katz said he also doesn’t own a microwave. “We’re actually thinking of buying one,” Katz said. Hobby, an environmental lawyer, said electromagnetic fields interfere with birds and pollinators, such as honeybees. “It affects migratory birds because they get disoriented and they don’t know which way is north when they come near these towers. Right here, you’re only a few hundred feet away from the pacific flyway. We’re on the pacific flyway for migratory birds for all of North America,” she said, while standing at Crescent Beach. A spokesperson from Freedom Mobile, the company proposing the tower, referred PAN to documents provided to people neighbouring the project. The information package says the company is proposing the cell tower to improve coverage and network quality in the area. The plan is to replace an existing 9.1-metre City of Surrey streetlight pole with a 14.9-metre streetlight telecommunication pole. The document says Innovation, Science and Economic Development Canada manages communications spectrum in the country and requires cellular telecommunications facilities to comply within the guidelines set by Health Canada to protect those who live or work near the facilities. The document says Health Canada’s safety code is among the most stringent in the world. “All Freedom facilities adhere to and are generally well within these standards,” the information package states, adding that the cell tower will be installed and operated on an ongoing basis to comply with Health Canada’s Safety Code 6. Katz pointed to a study from the World Health Organization and International Agency for Research on Cancer that classified radio-frequency electromagnetic fields as “possibly” carcinogenic to humans. However, according to a separate WHO document, it concluded that electromagnetic hypersensitivity is not a medical diagnosis. “EHS (electromagnetic hypersensitivity) is characterized by a variety of non-specific symptoms that differ from individual to individual. The symptoms are certainly real and can vary widely in their severity. Whatever its cause, EHS can be a disabling problem for the affected individual. EHS has no clear diagnostic criteria and there is no scientific basis to link EHS symptoms to (electromagnetic field) exposure. Further, EHS is not a medical diagnosis, nor is it clear that it represents a single medical problem,” the WHO document states. Fraser Health declined to comment, but referred to the “Radiofrequency Toolkit” on the BC Centre for Disease Control (BCCDC) website. The BCCDC toolkit says that electromagnetic hypersensitive individuals make up one to 10 per cent of the population. The document says that studies are limited to examining acute exposure to radio frequency. “Chronic exposure to RF on persistent human health symptoms have not been studied thoroughly,” the document states. Katz said that although he uses the technology, he’s going to see if the tower can be relocated to an area away from people and the beach. This entry was posted on March 7, 2019, 1:17 am and is filed under antenna, British Columbia, Crescent Beach, microcell, small cells, Surrey, White Rock. You can follow any responses to this entry through RSS 2.0. You can leave a response, or trackback from your own site. thank you for helping to stop this proposal. the city of surrey has not entertained by-laws to date demanding safe use of this technology. neither the willfully ignorant mayor doug mccallum, nor his evasive office clerk have responded to my letters and calls over the past two years, nor most recently in light of this proposed cell tower. they pass my concerns of this technology on to city planning, so they say. planning has never contacted me. they seem to ignore the concerns. the planning department hides behind land use allowances instrumented by the industry in the 1996 telecommunications act and half-a-century-outdated safety code 6 from the 1950s RF radar technology, as you already know. section 704 of the TCA states that no health or environmental concern can interfere with the placement of telecom equipment such as cell towers and antenna. what insanity is this? someone should point the 404 error from the old robust missing in action, citizens for safe tech site to your page to facilitate continuity.